Legendary BBC host launches monthly LA Friday party TONIGHT! If there were a Moses of dance music, you’d be hard pressed to find a more qualified candidate than Pete Tong. The legendary — but still very relevant — DJ established himself as an electronic music pioneer on BBC Radio One, launching his seminal Essential show way back in 1991 and has since grown to become one of the most respected voices in all of music — be it dance or otherwise. Plus, he was just awarded an MBE (Member of the Order of the British Empire) by the goddamn Queen Of England — can Oakenfold, Sasha or Coxie claim that? Now Pete Tong has relocated to Los Angeles, as nearly every ambitious artist seems to be doing these days, and has established a new residency at what many consider the best dance club in Hollywood: Sound. (Many would argue Avalon, but that’s another story.) After jumping ship from the BBC, Pete Tong can now be heard everyday on iHeartRadio’s EVOLUTION channel, on a two-hour show titled “All Gone Pete Tong” (7-9pm EST). If you don’t have iHeartRadio, the syndicated hour-long ‘Evolution with Pete Tong’ can be heard across America, including LA’s KIIS FM every Sunday from 11pm- 12am. As a sort of live counterpart to the radio show is his once-a-month residency at Sound. On these Fridays, starting tonight, Tong will take over the turntables along with a hand-picked special guest. Blessed with an almost mutant intuitive grasp of the underground, don’t expect Tong to be filling the slots with big room Vegas douchebag throwaways — he’ll be delivering some of the best DJs the underground has to offer. 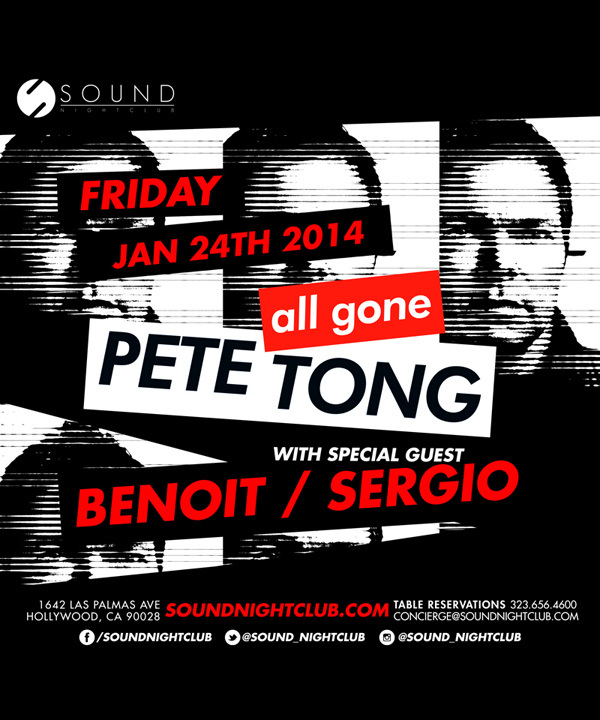 That’s why his “All Gone Pete Tong” night will kick off with Benoit + Sergio tonight (January 24), and will then welcome Lee Foss and his Modern Amusement party next month on February 14th. Future guests to be announced.